I promised you several weeks ago that I would lay before you the extraordinary virtues of red shoes. 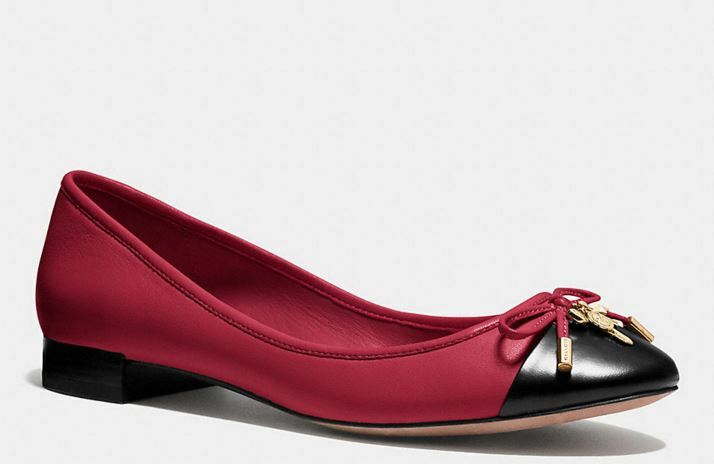 A pair of red shoes turns black separates (perfectly respectable clothes) into an outfit. (See this earlier post for an explanation of the taxonomy of dress.) This is the kind of outfit I put on when I am feeling very lazy. Would this outfit work as well with shoes of another color? I can’t say definitively, but my educated guess is no. There is something special about red shoes. You may be thinking that with this dark ensemble and red shoes, a red bag would be right. Non. I think limiting the color to the shoes is the way to go, so I am carrying a black bag — but it’s a bag with some pattern in it and therefore not flat black. Would you look at my expression? I am 3,000 miles away from my body in this photo. I wonder what I am thinking about, and how I got there so fast. I wore this to work last winter, a couple of days before Christmas when Metro ridership is pretty thin at rush hour. 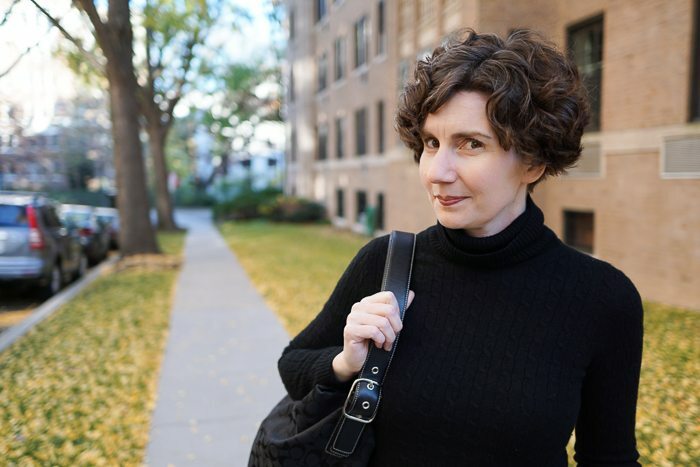 I ran into a friend and he said, “You look like you’re headed off to modern dance class.” I think he must have been thinking of Audrey Hepburn’s smokey cafe scene in Funny Face. 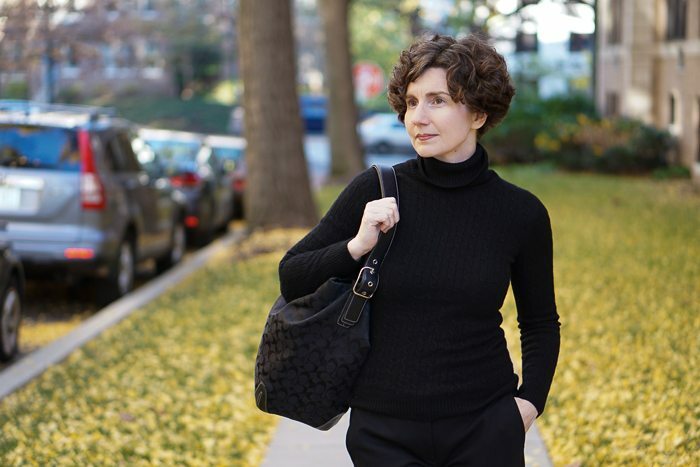 But trust me, a black turtleneck sweater, slim black pants and red shoes (flats or loafers) is fool-proof chic. If you haven’t seen Funny Face, it’s a treat — athough Audrey doesn’t wear red shoes. She wears black penny loafers with white socks. The socks were a point of intense dispute (like, crying) between her and director Stanley Donen; Audrey thought they would look dreadful, but Donen understood that the contrast they created would animate her big scene. This backstory is charmingly told in Dancing on the Ceiling by Stephen Silverman, which is a fun read if you love classic Hollywood movies. And if you are thinking, Directrice, I have two minutes each day to spend on entertainment so, no, I’m not going to watch that movie or read that book . . . let me offer you some red shoes. I love red shoes and wear them with black, as you have, or navy or gray. A favorite combo of mine is tan pants, navy blazer, blue or blue stripe shirt, and red shoes. 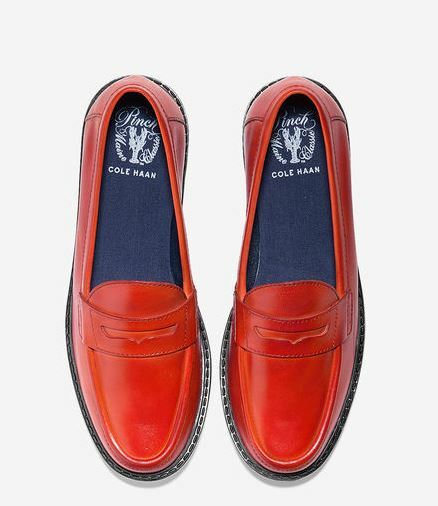 I have a pair or old Cole haan loafers that look like yours, a pair of ferragamo Varinas in dark red patent, and a pair of amalfi oste flats in red suede. I never wear heels so that means I’m set for all occasions that could call for red shoes! Best outfit ever! So simple, so chic. And yes — The red shoes make it. I especially love the deep color of the shoes. I can’t bear bright red. THIS red, on the other hand, is perfection. Directrice, your job is done. Yes. I must copy this immediately. Somehow I won’t look nearly as chic, but I can live with that. The deep red (oxblood?) is beautiful. You’ll look better than me — Directrice 2.0! I have a feeling deep down inside . . . I am wearing red loafers today too — with a black bag and black and white, because I started the day in Florida and all black would have been too much. But I agree completely that it turns separates into an outfit. Hello Amy! Smart choice for Florida. I also like a white blouse, khakis, and red shoes OR a black top, khakis, and red shoes in warmer weather. I have those exact shoes!!! 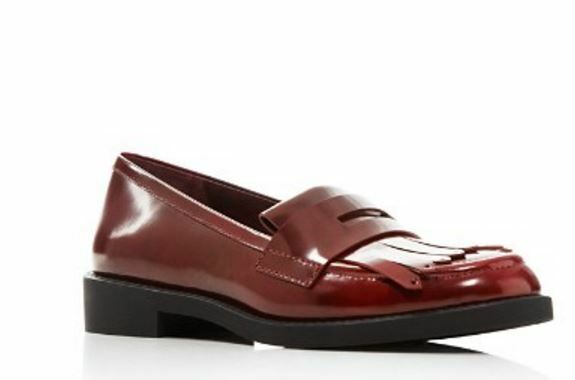 And I’ll be donning them tomorrow with slim black trousers and turtleneck – excellent example of style that you are. I’ll be adding my charcoal grey pea coat for a little dimension and warmth. Because I refuse to wear socks with those shoes as well. Ha! Aren’t they great! I only wear mine a few times a year and so they have lasted forever. Ha! Aren’t they great! They’ll look beautiful with your charcoal grey coat. I only wear these shoes a few times each year, so they’ve lasted forever. Can you comment on whether you wear those little ped sock things that always slip off the heel? Or do you just go barefoot in your shoes? Hi Hope! It depends on my mood and whether it is hot or cold. Sometimes I wear little peds, sometimes no socks. If I don’t wear socks, I wipe down the insides of my shoes at the end of the day to make sure any grime is removed. Sometimes I even use a little isopropyl alcohol or hydrogen peroxide on a cotton ball to clean the footbed — but must be very careful not to get any on the exterior of the shoe. 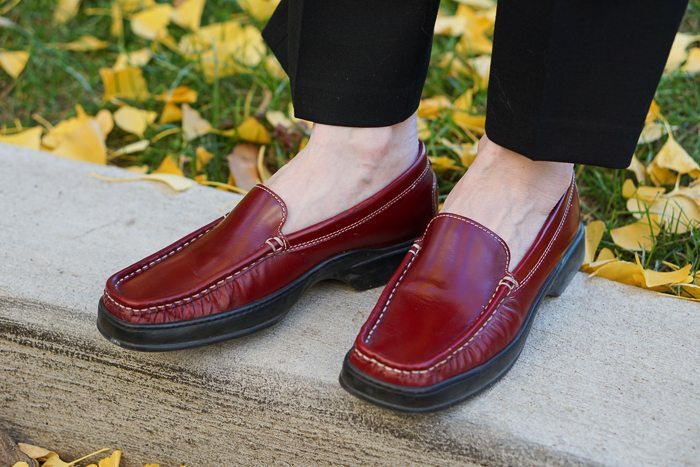 The red Cole Haan loafers have made it to my holiday wish list, which has already been filed with my husband! You may want to let your husband know that Cole Haan is having a big sale right now — 30% off everything. Run, don’t walk, to their website!